A snap of one of my front page articles. Ever since I was a little girl, I’ve loved words. Of course I liked to play with my dolls and tea sets as all little girls do, but I enjoyed words, reading and writing has always been something dear to me. I remember during elementary school when school was out for the summer and my mother would work, that our neighbor would babysit my younger brother and I. Sometimes we would sit in front of the television tranced by whatever child’s cartoon was popular at the time, but my favorite time of those summer days was lying beneath my neighbors tree, enjoying the fresh shade and reading. I read all sorts of books: adventures, mysteries, horror, non-fiction, etc. Even as a kid, I was never deterred by the length of a book; if it caught my attention and sparked my curiosity to know what wondrous story hid between those pages, it was worth adding the extra weight to the large stack of books I would frequently check-out from the library. It wasn’t until sixth grade though that I discovered the power of writing. At first, I didn’t particularly enjoy writing. I found the standard five-paragraph style of writing that we all learn in elementary, tedious and boring, but then something occurred in sixth grade that changed my feelings towards writing forever. I don’t recall the exact date, I can only remember that it was in the sixth grade when my older brother was shot due to what I later realized, must have been rivaling gang tension. Fortunately, his close encounter with death was brief and the medics were able to save him. Nonetheless, this event was life-changing for it was then that I found my love and purpose in writing. At the time, I didn’t have a computer so I grabbed a notebook and a pencil, and began to write what had happened to my brother in the form of a news article. I suppose it must’ve been the fact that to this day my father will switch whatever he is watching at 5pm to the evening news, that I wrote the events in that manner, even though at that age I wasn’t in any sort of journalism class. After finishing the story, I taped both pieces of paper together and to a wall in my bedroom. I wanted everyone and anyone who walked into my room to see those papers on my wall, and to read and learn the story of what happened to my brother. I wanted everyone to feel the outrage I felt at the sadness and violence that occurs in this world. Through that article I felt the power of expression. The power of being able to reach people through words not only to just share and entertain, but so that hopefully, they would learn something from those sheets of paper and share it with others. That’s what I love about writing, the ability to share your words and thoughts with others, even if it’s something that you were assigned to do by a teacher, professor, editor, boss, whomever, I wanted what I wrote to be useful and remembered, at least part of it. After writing that article and realizing how much I enjoyed it, I decided to write more frequently. Before the article, as most girls have, I had a Tweety bird diary, but it was mostly filled with summaries of my days, now I wanted to write something deeper. Conveniently, this newfound love for writing occurred around puberty and when I first started to take notice of boys so it helped me keep all of my thoughts and emotions controlled so that I wasn’t your typical crazy pre-teen lashing out at the world because she’s insecure and not in the popular crowd. All those things that most people learn aren’t worth worrying about, my poems and reflections would help me battle them out on my own, in my room and past my bed-time when everyone was asleep. I continued writing poetry during middle school, but stopped shortly after 8th grade promotion, finding inspiration was trying. I continued to write refections and thoughts until junior year in high school when I realized that I wanted a career in journalism, so naturally I joined the school paper. I mostly wrote news and opinion pieces. I recall when I was in fourth grade with my teacher Mr. Franco, that he once told me to never stop asking questions and I always remembered that and never did stop. I guess that may be a reason why I considered a career in journalism, because I wasn’t afraid to ask questions and however many necessary to get the information I wanted. My curiosity to know and desire to give others information through writing, is what I believe always intrigued me about journalism, and the reason why I earned B.A. in Communications and English. 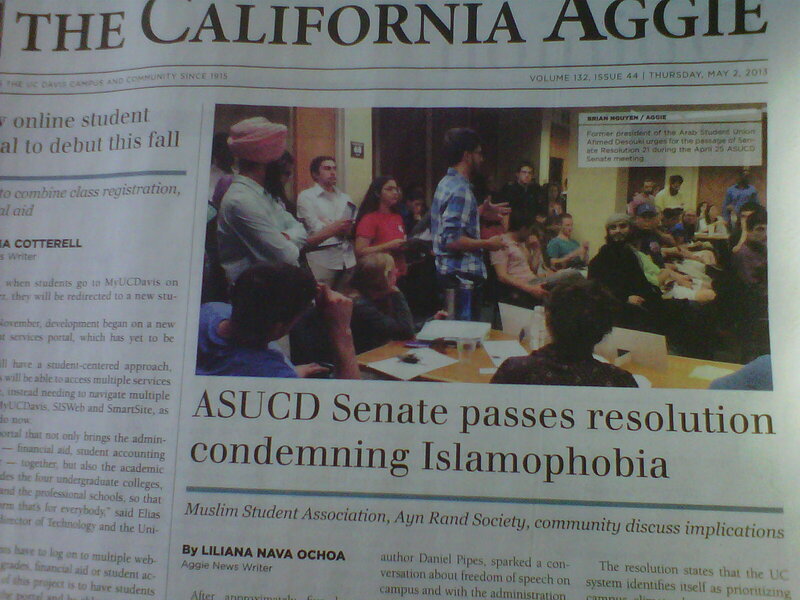 My third and fourth year in college I wrote for the school newspaper, The California Aggie. During my first and second year, my writing solely consisted of lengthy English class essays. But junior and senior year I also wrote one story weekly and although at times it was tiring because of the extra hours it added to work I needed to do aside from my job, classes and other extra curricular activities, I thoroughly enjoyed and loved it. The sensitive pieces I wrote are the ones I was almost most relieved to complete and happy to receive feedback from. Those articles were the ones that I stressed over, researched, edited and spent the most time and effort on because I always wanted to provide a fair, complete and unbiased account of events, as all good journalists strive to do. I remember during a meeting with my editor that she told me a writer for The Sacramento Bee told her that they thought my anti-semitism piece was well written (my first sensitive piece that I was really nervous about throughout the process of getting it on the stands). It was then when I finally accepted that I had a talent that I could create a career from; that was one of the first moments when I truly believed that I had a chance to make it in journalism. People had always told me that I was a good writer, but I never really believed it, perhaps because I had this misconception that writing was something anyone was capable of doing. I always thought people said that because even if they didn’t like what I wrote, they wouldn’t say that because after all, who wants to be the bearer of bad news and tell someone what they created is no good? No one. But when she said a writer for an actual newspaper enjoyed it, then I thought that if someone who has a profession in writing enjoyed one of my most difficult pieces to write, then I had a chance. I later acquired more internships involving media, writing and journalism where I interacted with and learned from broadcast reporters; one common piece of advice they each gave me: never stop writing. It had been a long time since I wrote because after graduating last year, I began working two-jobs, one of them full-time so I did not have much spare time, but I am not losing sight of my dream to become a journalist. Whether it is print or broadcast, I know writing is the beginning and it’s a good one for me because I love writing; I mean, I’ve rambled on for quite a while now about my writing trajectory. When we’re children and throughout our lives until it seems we’ve chosen and settled with a career, people are always asking: what do you want to be when you grow up? As a child, my answers varied from singer to veterinary to actress, but after middle school my only answer was, “a reporter”. I want to reach audiences with my words and give them new information. This blog is going to be an avenue through which I continue to write not only for whoever may or may not be reading this, or for my future, but for myself. Writing is the only thing I’ve never completely stopped doing or got bored of. It’s my way of giving some understanding to myself and the reader and lastly, a way of feeding that curiosity I never lost. My words have no limits and boundaries, I will write what I choose, feel and perhaps what some may disagree with, but what’s important is that I’m doing what I love and in a small way reaching for my dream.